As I explained yesterday, the Buffalo News editorial board endorsed Mayor Byron Brown in Thursday’s edition. Brown is running for his third term as mayor of a struggling, poor rust belt city who runs a hyper-politicized, allegedly corrupt petty fiefdom. With a million in the bank, he can steamroll over most challengers and has built an interdependent political machine, cavalierly flaunting the laws that ostensibly limit municipal employees’ electioneering, and his ability to compel it. Byron Brown is a nice enough guy and people like him, but I don’t think he’s the mayor Buffalo needs. Before you hammer me for not living in the city and opining on the election of its chief executive, I’ll concede the point. But I spend far more of my waking hours working in the city than at home, and I am a firm believer in regionalism. I believe that a strong and prosperous Buffalo is good for everybody. It is the region’s anchor – its entire reason for being, and it’s in everyone’s interests to care how it’s doing. I’m not a Republican, but I think that Sergio Rodriguez has run a strong, issues-based race against Mayor Brown, and he’s done so despite being forced to navigate a figurative minefield to do it. He has no support from the county Republican committee, and doesn’t have enough money to do much of anything. He’s bought some lawn signs, but doesn’t have the scratch to do a set of mailings, much less to get on radio or TV. Instead, he’s been wearing out his shoes, going directly to voters, and he’s been using social media in a town where promotion on Instagram or Foursquare isn’t going to go far. The Republicans? Some will privately say that they think Sergio isn’t ready for primetime; that they like him, but while he has good ideas, he hasn’t done much to see them through to completion. They’ll tell you his follow-through stinks, but they’d be in a unique position to help him out with this. What a coup it would be for them to take City Hall after a few generations! But they, too, have a business relationship with the Brown Administration, and it’s best to not rock that boat. Stefan Mychajliw is running for his first full term as County Comptroller. Despite the fact that he has literally no idea what he’s doing and treats every press release (and there’s one about every day) as an “audit”, and despite the fact that the “best and brightest” whom he’s hired have abandoned ship, he has charisma, name recognition, and a compelling backstory which will likely propel him back to the 11th floor of the Rath Building. Kevin Gaughan was the Democratic fallback candidate, and while he runs rings around Mychajliw on the details, he doesn’t even come close to touching Mychajliw when it comes to retail politicking. One of the reasons the Republicans won’t help Sergio has to do with city turnout; if there was a competitive Mayoral race, Democrats would vote; if city Democrats turn out to vote, they’ll likely vote for Gaughan. So, they sacrifice Sergio to help ease Stefan’s re-election. Sure, it makes perfect tactical sense, but it’s fundamentally cynical. The News’ endorsement of Brown is astonishing because it has very little, if anything, positive to say about Brown’s accomplishments as Mayor. Almost all of the major projects taking place, representing Buffalo’s “boom” exist in spite of Brown, rather than because of him. More often than not, they come about when he gets out of the way. He gets to show up at the ribbon-cutting and make a proclamation, and then skulk back to the 2nd floor, behind armed guards, to oversee fiefdom. The boom that the Buffalo News identifies is illusory. For every new restaurant, medical building, and waterfront announcement, the city’s problems with poverty, crime, joblessness, hopelessness, and failing schools all continue unabated. The big-ticket items are good, but if a city can’t get the fundamentals right, what point is there? People point to positive changes along Grant Street, but gentrification without population or income growth is as unsustainable as sprawl without growth. What the city needs is a leader, not a caretaker. Can Sergio be that leader? I think he deserves more of a shot than he’s getting, and the forces aligned in halting him should be ashamed. Even tea party developer Carl Paladino knows that it’s better for him to back Brown and shun Rodriguez if Paladino wants his city projects to go smoothly. Brown hasn’t even deigned to compete against Rodriguez, which is the ultimate insult – denying voters a race they deserve. But whether or not you think Sergio is the leader Buffalo needs, he has spent months talking about the fundamentals – talking to residents and business owners (small ones, the ones who serve the community rather than big-money interests) about the problems that they face on a daily basis. It’s not pretty – Brown is busy on the radio promoting jobs at Geico way the hell up in north Amherst, so you’re all set if you have a reliable car. 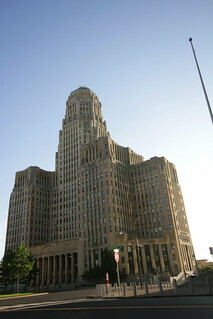 Buffalo needs jobs for Buffalonians in Buffalo. There’s no regional plan for much of anything, and one would expect a Buffalo mayor to focus on the quality of life basics, not to ensure his re-election, but to make sure his constituents are better-off. If you’re one of the preservationist elites, Mayor Brown has had almost 10 years to develop a strategic plan to market and help people finance the purchase and renovation of dilapidated and vacant city-owned foreclosed homes. Just yesterday, a vacant city-owned house near Grant Street was demolished, and no one knew it was for sale because the city doesn’t put up signs or list them properly. Sergio Rodriguez may deserve your vote, if you’re so inclined, but at a bare minimum he deserves your attention. He’s talking about the bigger picture, and recognizes that a leader requires a vision. In a town where the mayor has touted the number of demolitions he’s overseen, Sergio has instead addressed the issues of joblessness, crumbling infrastructure, failing schools, vacancies, and crime – things that don’t particularly matter to big developers with Rolls-Royces. But Sergio is also the guy who says City Hall will be open and inviting to all, and where good ideas will find a home. It will be inclusive and transparent, rather than an impenetrable fortress. Is it Sergio’s time? That’s up to you. But he certainly deserves your attention and your thoughtful consideration. I think he’s talking about the important things no one wants meaningfully to discuss, and his party affiliation shouldn’t be held against him.